We believe students succeed best in learning environments that support them to become the drivers and owners of their learning. Of course states should set high common standards of skills and knowledge to be mastered by each generation of students, but the tasks on which students engage throughout their learning journeys will be more meaningful and impactful when they learn deeply and in context. A high quality education kindles curiosity, and does not extinguish it for the vast majority of individuals who stray from the average pace of learning. As noted in the quote above from Michael Horn, Blended Personalized Learning moves beyond putting devices in students’ hands and, instead, pushes the boundaries of the traditional classroom in terms of “time, place, path, and/or pace of learning.” Oakland’s public schools are now largely technology-enabled, with pockets of truly high-quality blended instruction at the classroom level. The Foundation’s eight blended learning pilot schools lit a spark; their lessons on infrastructure and support have scaled across the city. This initial effort gained nationwide attention, resulting in the Foundation’s capacity to bring more resources and expertise to expand our work beyond individual teachers and classrooms to create innovation through high-quality blended personalized learning schools that reach all of their students. These schools sought to fully reimagine the role of student and teacher to create breakthrough achievement, joy, and sustainability. The next phase of work in our strategy manifests itself largely through local proof points as part of the Next Generation Learning Challenge in Oakland grant program (NGLC in Oakland). In 2015, NGLC in Oakland selected teams at ten schools to receive planning grants to spur innovation, develop proven solutions, design promising pilots, and nurture groundbreaking partnerships. 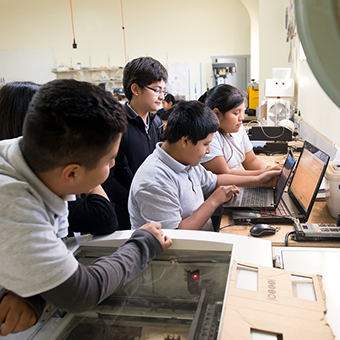 In the spring of 2016, NGLC in Oakland rolled out its next round of funding with seven schools—three district-run and four charter-run—receiving multi-year grants to bring their designs to life. Additionally, the work of NGLC in Oakland engaged a broader set of educators in the city through trips to innovative schools, networking opportunities, and other events. Through the 2019-2020 school year and by invitation, NGLC in Oakland will continue to invest and reinvest in Oakland public schools that aim high on the California School Dashboard and personalize learning in order to reach those quality outcomes. 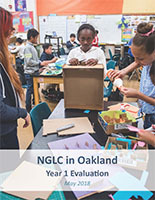 Ultimately, NGLC in Oakland hopes to play a role in cohorts of schools and aspiring school teams to engage in regular cycles of discovery, planning, design, and launch that further influences the larger system of schools toward more NextGen models. Our goal for Blended Personalized Learning is to engage school (re)design teams of leaders, teachers, parents, students, and community stakeholders to create 3,000-5,000 high quality, innovative, personalized, student-centered seats by 2020. To accomplish this, the Foundation will focus on launching successful school models to serve as local examples, creating capacity for rapid prototyping of new ideas, and building teacher leadership to support innovation. Fund the launch, implementation, and evaluation of blended personalized models. 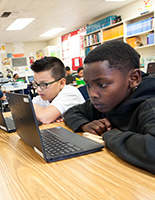 Beginning in the first quarter of 2016, and in partnership with other funders, the Foundation awarded NGLC in Oakland launch grants for seven Next Generation schools that serve as local blended personalized proof points, and will soon contribute to the Foundation’s goal of creating high-quality schools for Oakland families. The majority of resources target students and school communities furthest from opportunity. Build the pipeline for NextGen schools. There is no shortage of opportunities for school operators, partner funders, and third-party consultative design organizations to engage in new model design. Coordination and communication enables matching a diverse set of schools and leaders to appropriate and formalized services and pathways, including our own ongoing “Discovery” events, such as visits to innovative schools. A diversity of support options and pathways increase any single school’s ability to find what they need next in their model development. Based on school and teacher demand, we have recently supported the work of Agency by Design Oakland, School Retool, and the Mastery Design Collaborative. Support classroom- and school-based pilots of educational technology. Foundation staff members guide schools and teachers at the earliest stages of the NextGen pipeline to use their existing resources in innovative ways, and will also partner with select community organizations as needed. We know from our previous experience that greater impact occurs when grantees receive additional supports from the Foundation. As such, we will strive to add value to the work by selectively providing “beyond the grant” staff support to Oakland schools, operators, and ecosystem organizations to scale lessons learned, and foster cross-organizational partnerships with the potential for breakthrough impact. In addition to the resources highlighted below, over the years we have cataloged blogs, books, videos, case studies, reports, educator resources, and other information to help others implement blended personalized learning in schools and districts. These resources can be found here. The Bill & Melinda Gates Foundation engaged RAND Corporation to carry out an ongoing study of foundation-funded schools that are employing promising approaches to personalized learning. This research is part of a public commitment the foundation has made to spread effective practices across districts and charter networks, develop innovative roles for teachers, and support implementation of college-ready standards. There are a variety of definitions for Blended Learning within the larger education community. The Rogers Family Foundation's work is guided by two definitions developed by the Clayton Christensen Institute and the Learning Accelerator. The MyWays Toolset from the Next Generation Learning Challenge helps educators address the Three Big Questions of Next Generation Learning: How well are we defining and articulating what success looks like for students attending our school? How well does our design for learning and the organization of our school directly support students' attainment of our richer, deeper definition of success? 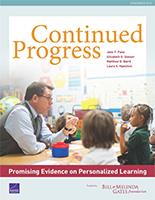 How do we gauge students' progress in developing those competencies? And: How can we measure and articulate our school’s overall performance, beyond proficiency in English Language Arts and math?